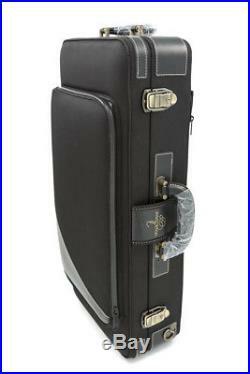 Yanagisawa AWO Alto Sax Case - Suitable for Yanagisawa Alto Saxophones. 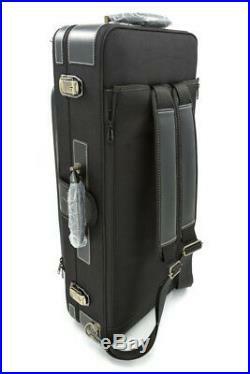 This is the official Yanagisawa Alto Sax Case that is supplied with the current AWO models. This deluxe case has backpack straps zipped into the back cover, has a hard shell that will provide ample support and has 3 strong clasps to keep the instrument safe. Although this model is designed for the new AWO series it will also fit older A901/A902 and A991/A992 models, and the A9930 and A9932/A9933 silver models as well. Please note this case may not be suitable for other brands. Internally the case has a padded and plush interior to support your Sax and comes with a space for neck and also for spare accessories. There is an external handle on the side and on the top for various carrying options. The case also has a zipped outer pocket of a very useful size that you could carry music or other sheets/books within. Designed for Yanagisawa Alto Models. Padded backpack straps can be zipped away when not in use. Strong, supportive and high quality. Dawkes Music is a specialist Woodwind & Brass retailer operating from a 6800 square foot Warehouse in Berkshire, United Kingdom. The shop carries over four thousand accessory lines and over 4000 Instruments and has a dedicated Saxophone Suite with all the best Saxophones on show. The item "Yanagisawa AWO Alto Sax Case Suitable for Yanagisawa Alto Saxophones" is in sale since Wednesday, April 18, 2018. This item is in the category "Musical Instruments\Wind & Woodwind\Parts & Accessories\Cases & Bags". The seller is "windcraft-ltd" and is located in UK. This item can be shipped worldwide.